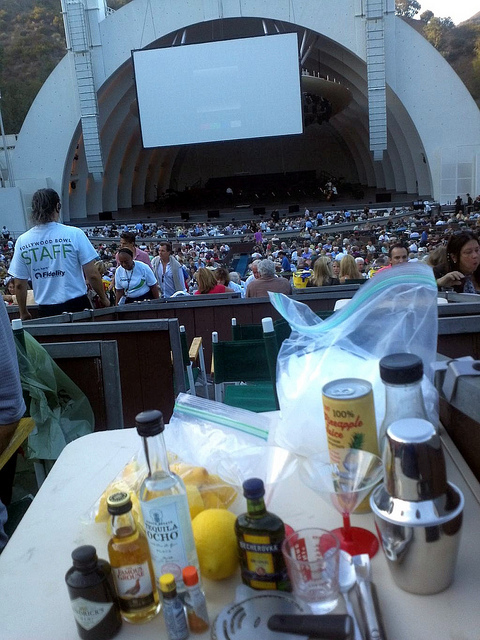 When I first started going to the Hollywood Bowl, I’d show up basically with a sandwich and iced tea. I remember sitting there gnawing away at a lame sub seeing a man in his box who had brought a tablecloth, flowers, a bust of Mozart, candles and big bottle of Johnny Walker Blue. Years passed and we started bringing bottles of wine and the occasional bottle of soju. And this year? Why, I decided I was going to go all out. 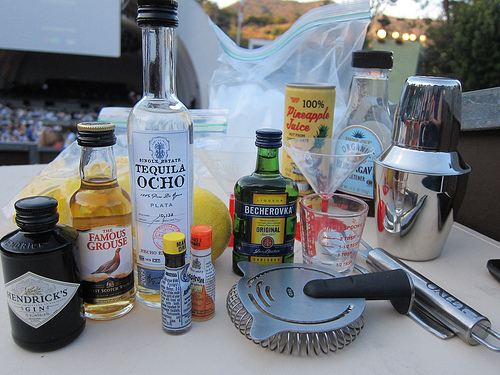 To bring a makeshift bar to the Bowl requires some planning. First of all, I didn’t want to lug that much. I collected a few miniature bottles of good spirits and bitters, cut up lemon wedges to squeeze for juice (of the lime versus lemon question, I tend to go for lemon juice) and then I assembled everything else- from my mini shaker, Hawthorne strainer, zester, whole lemon for the peel, mini cocktail glasses and a spoon. I don’t have a mini bar spoon (is there even such a thing?) so a regular one will have to do. I also brought a shot glass, pineapple juice, ice and agave syrup. 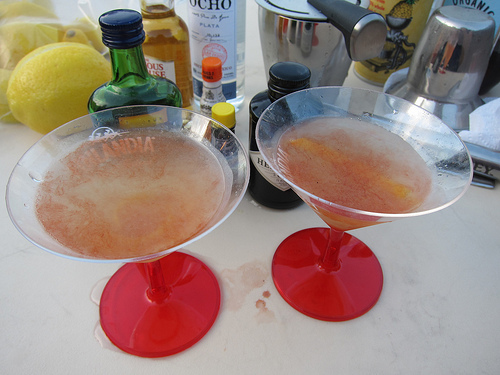 I decided I wasn’t going to muddle or make stirred drinks. It was pretty funny when people around realized I was mixing drinks. One called over that this was the best pre-concert show. And another said my drinks were too cute to even drink. But when the concert started, I put everything away and drank things neat. This entry was posted in alcohol education, alcohol tasting, bar stories, cocktails, events, la, la cocktails, los angeles, the minty, wine and tagged cocktails, hollywood bowl, making drinks, pop-up, the minty. Bookmark the permalink. Brilliant… and ambitious… I so love the concept!